The University of Rochester offers Humanities Research and Innovation Grants (HRIG) to selected incoming first-year students so that they can carry out an independent research project some time during their four years at UR. 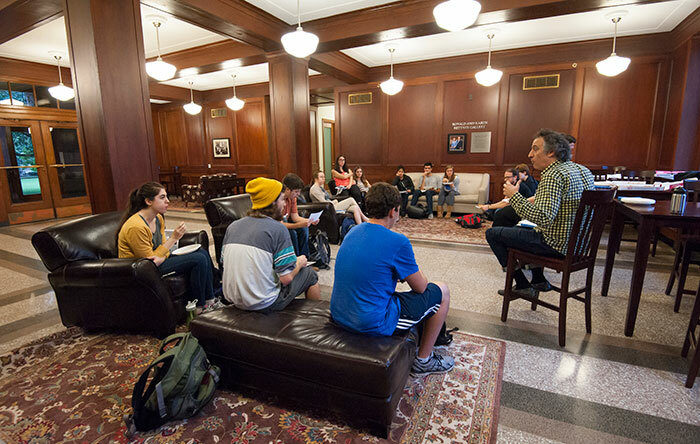 Until they declare a major, a Humanities Center mentor serves as the student's advisor. The Center offers many activities geared to undergraduate researchers to which the HRIG students are invited. Undergraduate Conversation with Prof. Ezra Tawil and students in Rettner Gallery September 29, 2015.